When was the last time you cleaned your child’s car seat? Let’s face it: Kids are messy, and car seats often suffer the consequences. Considering spilled milk, dropped snacks, blown-out diapers, drool, spit-up and vomit, your child’s car seat can quickly transform from a safety device to a breeding ground for germs. In fact, scientists at the University of Birmingham discovered that children’s car seats have twice as many harmful germs as the average toilet seat. Yuck! But there’s good news: There are things moms can do to get rid of these unwanted cooties. Here’s a step-by-step guide on how to clean car seats when the unfortunate happens, or just as part of regular maintenance. Tip: Before you begin, take a photo of the car seat so you can easily and correctly reassemble it when you’re finished. Disconnect straps or latches that connect the car seat to your vehicle. If you are using an infant seat with the latch system, make sure to disconnect the plastic base as dirt, dust and debris can fall into its nooks and crannies too. Move the car seat and plastic base to a flat, clean surface with good lighting. This will allow you to thoroughly clean the car seat without having to climb into your backseat, risking soaking the seat fabric… or hurting your back. Give the car seat and plastic base a good shake, both right side up and upside down, then using baby wipes, cleaning rags, or paper towels, wipe away any loose debris inside the car seat – abandoned dry cereal fragments, orphaned animal crackers, you name it. If you have a vacuum cleaner with a small attachment, you can use it to remove any lingering debris hiding in the crevices of the car seat and your back seat. Remove the fabric cover (if detachable) and harness straps from the plastic body of the car seat. 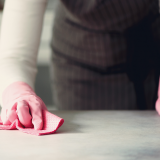 If you have your product manual handy, consult it for specific cleaning instructions. If not, most fabric covers can be removed by unfastening clips, snaps, or buttons from top to bottom. 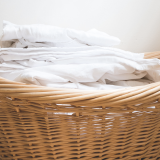 Using a circular motion, rub a mild detergent into any noticeable spots or stains. Place the fabric cover in the washing machine. Wash it on delicate cycle with cold water and a mild detergent. Let the fabric cover air dry. Note: If the fabric cover isn’t detachable, spot clean it using a clean sponge and mild detergent. Spot-clean the harness straps and buckle with a soft cloth, warm water, and gentle soap. Rinse and let it air dry. Make sure the inside of the buckle completely dries to prevent rusting or corrosion. Note: Many car seat manufacturers do not recommend machine washing or putting harness straps in the dryer because this can compromise the strength of the straps, resulting in a safety hazard. If your car seat uses a plastic base, clean it using a damp cloth or sponge, warm water, and a mild detergent. To prevent water and mold buildup, rotate the seat a few times after you have rinsed it. Use a disinfecting wipe to gently sanitize the plastic base. Let the seat air dry. Once everything is completely dry, put the car seat back together, making sure the straps are not twisted, and reattach the car seat to the car. Refer to your product manual for any specific questions about reassembling the car seat. And that’s it! With these tips, you can help keep your littlest co-pilot healthy, happy, and cootie-free.